Download "이 설명서의 올바른 참고문헌 인용은 다음과 같습니다. SAS Institute Inc. 2015. SAS University Edition: Amazon Web Services 용 설치 가이드 Cary, NC: SAS Institute Inc. SAS Universit"
8 7) SAS Studio 시작을 클릭하여 SAS Studio 를 엽니다. AWS Marketplace 에서 SAS University Edition 종료하기 Your Software Subscriptions 페이지에서 SAS University Edition 인스턴스의 상태를 확인할 수 있습니다. 1) Your Software Subscriptions 페이지를 엽니다. 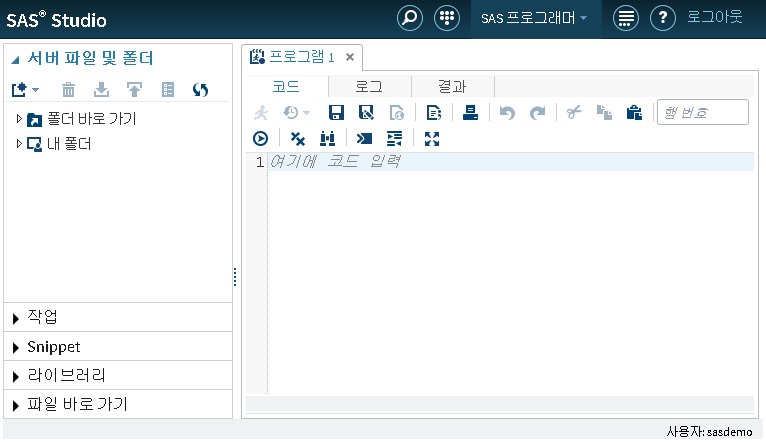 2) SAS University Edition 을 중지 또는 종료하려면, Manage in AWS Console 을 클릭합니다. 3) 콘설에서 Actions > Instance State 를 선택합니다. 현재 인스턴스를 저장하고 실행을 중지하려면 Stop 을 선택합니다. 새 창이 나타나면 Yes, Stop 을 클릭합니다. 인스턴스를 삭제하려면 Terminate 를 선택합니다. 업로드된 데이터는 유지되지 않습니다. 새 창이 나타나면 Yes, Terminate 를 클릭합니다. Amazon Web Services 에서 SAS University Edition 다시 시작하기 Amazon Web Services 에서 SAS University Edition 을 다시 시작하려면, 중지된 SAS University Edition 인스턴스를 다시 시작하려면, AWS 콘솔에서 Actions > Instance State > Start 를 선택합니다. 인스턴스를 종료한 후에 SAS University Edition 을 다시 시작하려면, Your Software Subscriptions 페이지를 엽니다. Launch more software 를 클릭합니다. 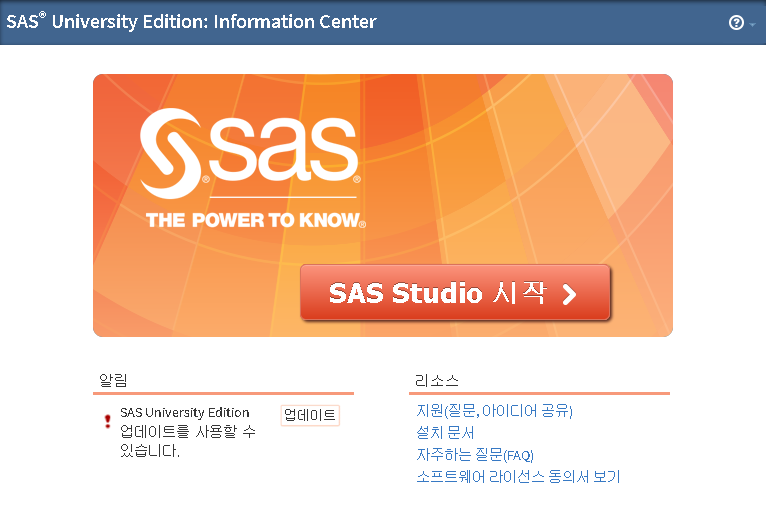 EC2 for SAS University Edition 페이지에서 기본값을 선택하고 Launch with 1- Click 을 클릭합니다. 10 4 장: 도움말 및 문제 해결 설치 문서 보기 SAS University Edition 에서 이 문서를 온라인으로 보려면, 1) SAS University Edition 을 시작합니다. 웹 브라우저에서 시작 화면에 표시된 URL 을 입력하고 Enter 키를 눌러 SAS Information Center 를 엽니다. 2) 설치 문서를 클릭하여 설치 문서를 봅니다. 다른 브라우저 창에서 SAS Studio 열기 SAS Studio 가 열려 있으면, 같은 웹 브라우저의 새 탭에서 SAS Information Center 를 열고 SAS Studio 시작을 클릭합니다. 창에 다음과 같은 메시지가 나타납니다. SAS Studio 세션이 이 브라우저에서 이미 실행 중입니다. 세션을 닫고 새로운 세션을 시작하시겠습니까? 예를 클릭하면, SAS Studio 세션이 현재 브라우저 창에서 열립니다. 아니요를 클릭하면, 창에 해당 메시지가 다시 나타납니다. 현재 브라우저 창에서 SAS Studio 를 열지 않으려면, 현재 브라우저 창을 닫습니다. PROC HTTP 가 ERROR: Could not find extension: (Tkessl) 메시지를 반환할 때 PROC HTTP 로 HTTPS URL 을 사용할 때 다음 오류 메시지가 반환됩니다. ERROR: Could not find extension: (tkessl) HTTPS 및 SFTP 액세스는 SAS University Edition 에서 지원되지 않습니다. 11 11 SAS is the leader in business analytics software and services, and the largest independent vendor in the business intelligence market. Through innovative solutions, SAS helps customers at more than 65,000 sites improve performance and deliver value by making better decisions faster. Since 1976 SAS has been giving customers around the world THE POWER TO KNOW.